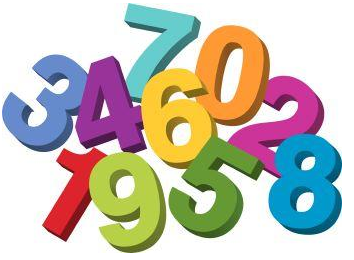 A number is a mathematical object used to count, measure, and also label. 1. Compare 4978 and 5643……. 5643 is greater as the digit at the thousands place in 5643 is greater than that in 4978. 9364 is the greatest as it has the greatest digit at the thousands place in all the numbers. Whereas 7924 is the smallest as it has the smallest digit at the thousands place in all the numbers. Here, we will start by checking the thousands place.As the digit 5 at ten thousand place is same so we will move forward and see the thousands place. The digit 6 is also same so we will still move on further to check the hundreds place. If we arrange the numbers from the smallest to the greatest then it is said to be an Ascending order. If we arrange the numbers from the greatest to the smallest then it is said to be Descending order. 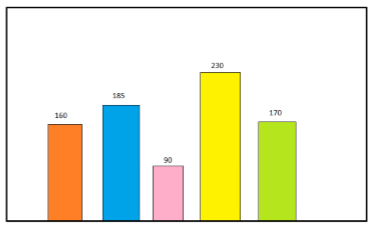 Arrange the following heights in ascending and descending order. 99 is the greatest 2-digit number. Moving forward, all the above situations are same as adding 1 to the greatest 4-digit number is the same as the smallest 5-digit number. (9999 + 1 = 10,000), and it is known as ten thousand. It refers to the positional notation which defines a digits position. It refers to expand the number to see the value of each digit. This number is called one lakh. To get the larger numbers also, we will follow the same pattern. 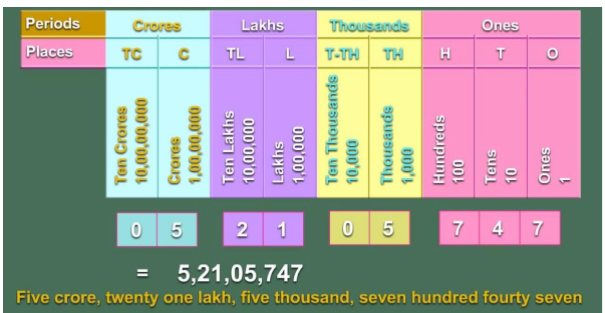 We will get the smallest 7-digit number if we add one more to the greatest 6-digit number, which is called Ten Lakh. Going forward if we add 1 to the greatest 7-digit number then we will get the smallest 8-digit number which is called One Crore. We can identify the digits in ones place, tens place and hundreds place in a number by writing them under the tables O, T and H.
We use commas in large numbers to ease reading and writing. In our Indian System of Numeration, we use ones, tens, hundreds, thousands and then lakhs and crores. We use the first comma after hundreds place which is three digits from the right. The second comma comes after two digits i.e. five digits from the right. The third comma comes after another two digits which is seven digits from the right. 1 kilogram = 1000 grams. To fill an order, the factory dyed 336 yards of silk in yellow and 37 yards in pink. How many yards of silk did it dye for that order? Thus, 371 yards of silk was dyed for the order. There are 8797 children in a town, 6989 go to school. How many children do not go to school? Thus 1808 children of the town do not go to school. There are 24 folders and each has 56 sheets of paper inside them. How many sheets of paper are there altogether? Thus there are 1344 sheets of paper altogether. $5,876 is distributed equally among 26 men. How much money will each person get? Thus each man got $226. It is a rough calculation of value. We use estimations when we have to deal with large numbers and to do the quick calculations. Firstly to estimate we need to see where does the number lies. Secondly, we will see if it is 5 or higher. Thus the number 738 is rounded off to 740. Round off the number 867 nearest to the hundreds. Now we have to check for tens place. If it is greater than 50 then we will round it off to the upper side and if it is less than 50 then we will round it off on the lower side. It is 67, which is greater than 50 and is closer to 900. And 500 is always rounded off to 1000. Round off the number 7690 nearest to thousands. Thus 7690 is rounded off to 8000. 3,210 will be rounded off to 3000. 12,884 will be rounded off to 13000. We use brackets to indicate that the numbers inside should be treated as a different number thus the bracket should be solved first. Brackets help in the systematic calculation. Numbers in this system are represented by combinations of letters from the Latin alphabets. b. We cannot repeat a symbol more than three times and some symbols like V, L and D can never be repeated. c. If we write a symbol of lesser value to the right of a symbol of larger value then its value will be added to the value of the greater symbol. VI = 5 + 1 = 6,   XII = 10 + 2 = 12 and LXV = 50 + 10 + 5 = 65.
d. If we write a symbol of lesser value to the left of a symbol of larger value then its value will be subtracted from the value of the greater symbol. 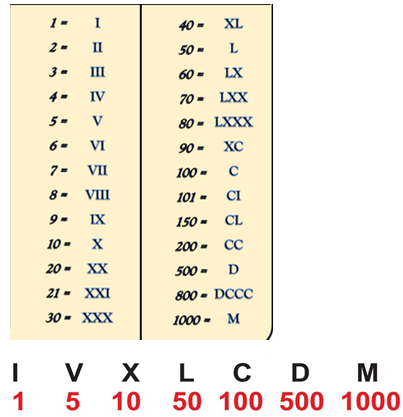 IV = 5 – 1 = 4, IX = 10 – 1 = 9 XL= 50 – 10 = 40, XC = 100 – 10 = 90.
e. The symbols V, L and D can never be subtracted so they are never written to the left of a symbol of greater value. We can subtract the symbol “I” from V and X only and the symbol X from L, M and C only.